Question : What could be the maximum time for which Neeraj could have been in the second position in the race? I am facing issues in visualization of the puzzle. Pls help. Because one person can no longer overtake another if the other has already overtaken him, Neeraj can only be second place during the lead of two consecutive people. Why two? Let's assume he started at position 2. For 13 seconds, no overtakings take place. Then, former position 3 (Harsh) overtakes Neeraj and Ashish, while Ashish falls behind you. Neeraj is now still position 2 for the next period (14 seconds). 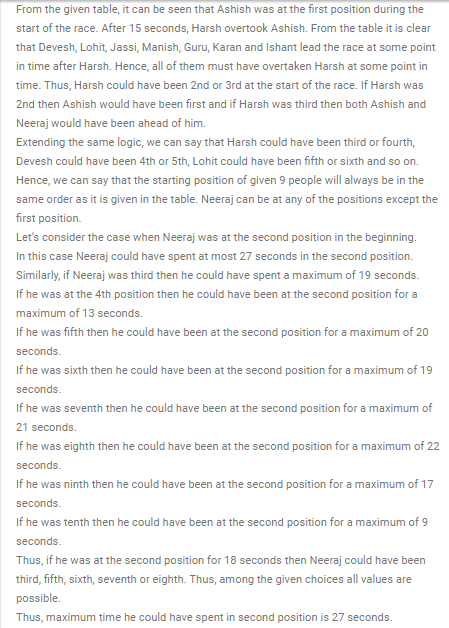 But now Neeraj can't stay on position 2 because he cannot overtake Harsh anymore, while Devesh overtakes them both. He will never get to position 2 any more. 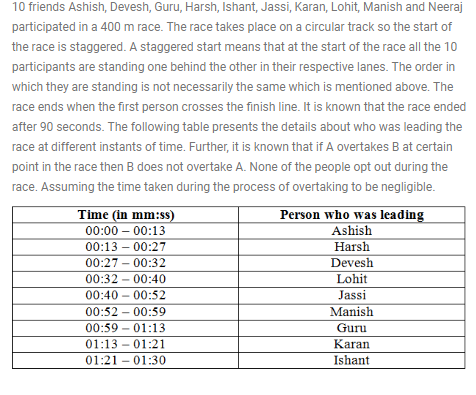 The longest period of two consecutive leaders is 27 seconds (Ashish and Harsh), and that will be my answer. Why is it 27 seconds? The situation is now unlinked from him finishing second at the end - or where he started at the beginning (we can choose his start and end position to our advantage). So we are looking for two adjacent leaders times that add to the most - which is the first two at 27 seconds. 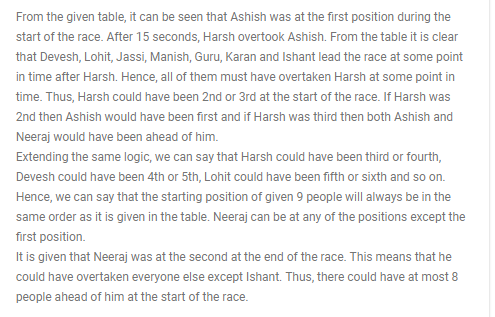 Think of a typical 400m footrace and how the inner lanes start further back - because they run a shorter route on the bends - so the inside lane starts "behind"
If Neeraj starts in last (the inside lane) and runs quicker than everyone but Ishant (who must have started 9th) Then he would finish 2nd.